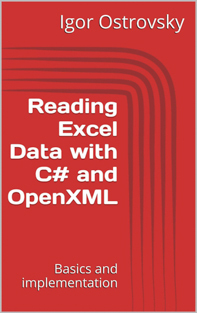 A software library for reading Excel data programmatically. Supports Excel spreadsheets in Open XML format (default format since Office 2007). Returns DataTable, containing data from the worksheet. If FirstRowContainsColumnNames parameter is set to true, the first row of data is treated as column names. Override of the previous method with FirstRowContainsColumnNames defaulting to false. Returns DataTable, containing data from the worksheet. Column names in Excel cell reference format are used (A, B, C, ..., ZZ).